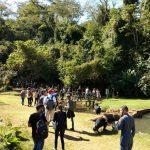 Dr Mary Gearey, Research Fellow in our school, joined 40 other British and Brazilian researchers for a four day, Newton funded workshop in July, exploring methods, strategies and theories in support of ‘re-naturing cities’. 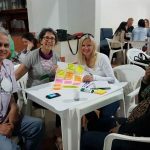 The event was held in Goiania, Brazil, Mary tells us more about it here. The Newton funded workshop brought together researchers from a wide range of disciplines including Architecture, Ecology, Public Health, Urban Planning, Human Geography, Soil Science and Land Management to share expertise around developing green infrastructure in highly dense urban spaces. My work on public perceptions in support of urban wetlands expansion contributed to a series of round-table seminars which explored a wide range of subjects from improving green roof structures to expand biodiversity, to extending community participation in developing public spaces through growing fruit, vegetables and flowers in street side rain gardens. Complementing existing ‘grey’ infrastructure – the buildings, roads, transport networks which are the fundamentals of city spaces – with ‘green’ infrastructure – city parks, tree lined greenway cycle paths and wilder areas such as urban wetlands – offers urban dwellers the chance to improve their health and well-being in a range of ways. From cooling down the ‘heat island’ effect of cities, both now and with a view to future climate change impacts, as well as improving air and water quality, expanding nature into cities via urban parks, green ‘wedges’ of land set aside for plants and trees and softening buildings through living walls and mobile gardens housed in skips, offers city dwellers a respite from noise and traffic fumes and improves access to nature for everyone, not just wealthier residents. This Newton funded workshop has demonstrated that the research I currently undertake within SET exploring the value of wetlands for local communities as part of a Natural England Research Council (NERC) project alongside Professors Neil Ravenscroft and Andrew Church has an international resonance and impact, and highlights the wonderfully diverse range of work undertaken by University of Brighton researchers. This is my second time in Brazil, disseminating and undertaking research on behalf of SET and the University of Brighton. 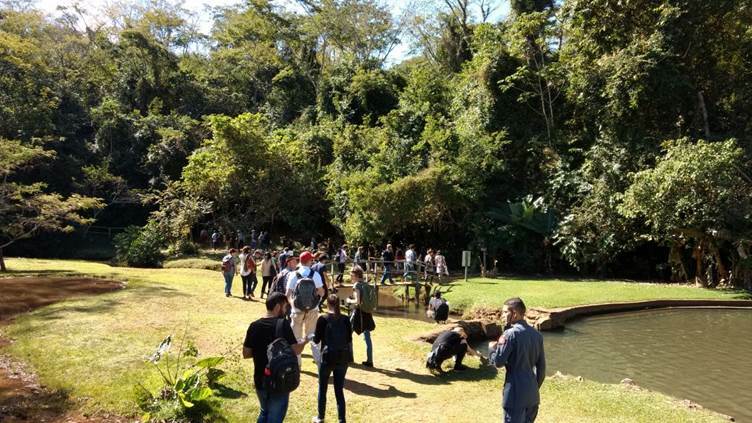 In November I worked with Physical Geographers at UNIVALI University in the South of the country, supported by a Santander Bank travel grant. Both times in Brazil I’ve got close up and personal with the wildlife; last time it was a surprise encounter with a rainforest bush rat in a rangers’ toilet, this time with this very cute monkey (pictured). 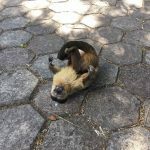 We found him in our hosts’ campus at the Federal University of Goias and thought he was adorable, rolling around on the floor and clapping his hands– until we discovered he was working a con act with another monkey who was going through people’s bags searching for food when we were distracted. What a cheeky monkey! Our Vice-Chancellor has called on the Government to take more notice of evidence pointing to an air pollution crisis facing the planet. 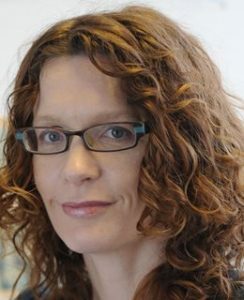 Professor Debra Humphris was commenting after scientists from our school presented new research showing how society was facing a “public health timebomb”. They told how air pollution is linked to 50,000 premature deaths in the UK every year, 9,400 in London and 430,000 in the EU as a whole, through heart disease, asthma, and even dementia. Lead researchers, Dr Kirsty Smallbone, Head of the School of Environment and Technology, and lecturer Dr Kevin Wyche, are studying ultra-fine particles which can pass through the lung alveoli and contaminate organs including the brain. The university’s Professor Huw Taylor has joined world experts to draw up an action plan to fight antimicrobial resistant (AMR) disease transmission through the water cycle. More than 700,000 people worldwide die every year from infection from antibiotic-resistant bacteria, and the threat is increasing every year. A UK government report warns that by 2050, 10 million people worldwide will be suffering from life-threatening infections from these bacteria if the issue is not urgently tackled. Professor Taylor, Professor of Microbial Ecology, in 2015 led an international team that advised the World Health Organization (WHO) on how to address the potential spread of Ebola through the water cycle through improved emergency sanitation measures. 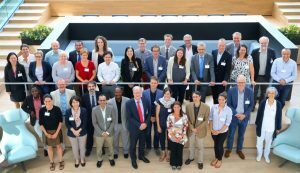 He is now lending his expertise to this new world-wide effort to tackle the problem of antimicrobial resistance and recently joined a host of experts at a meeting in the Netherlands organised by the WHO and KWR, a leading international water research institute. “Those most at risk from local air pollution are the elderly, children and those with heart or lung conditions. Without preaching, I would like to talk about the problems of air pollution, where it comes from, how it affects us, our children, our parents and our environment and importantly, discuss what may be the best ways to reduce our exposure to it,” explains Kirsty. Brains at the Bevy are a series of short and enlightening talks from local academics and all are welcome to attend. The talks take place at The Bevendean Community Pub in Moulsecoomb and each talk will last around an hour with plenty of time for questions and discussion. 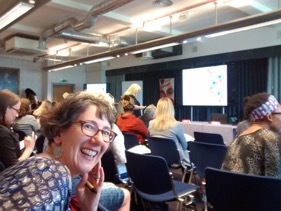 These free talks are organised by the Bevy and Community University Partnership Programme at the University of Brighton and funded by the Sussex Learning Network. Tea and coffee will be provided during the talk and everyone is welcome to stay on afterwards to enjoy the lovely food and drink available at the Bevy. 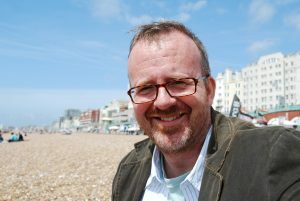 Keith Taylor MEP is hosting a public meeting in Brighton to discuss ways of tackling air pollution that experts claim leads to 40,000 premature deaths in Britain every year. 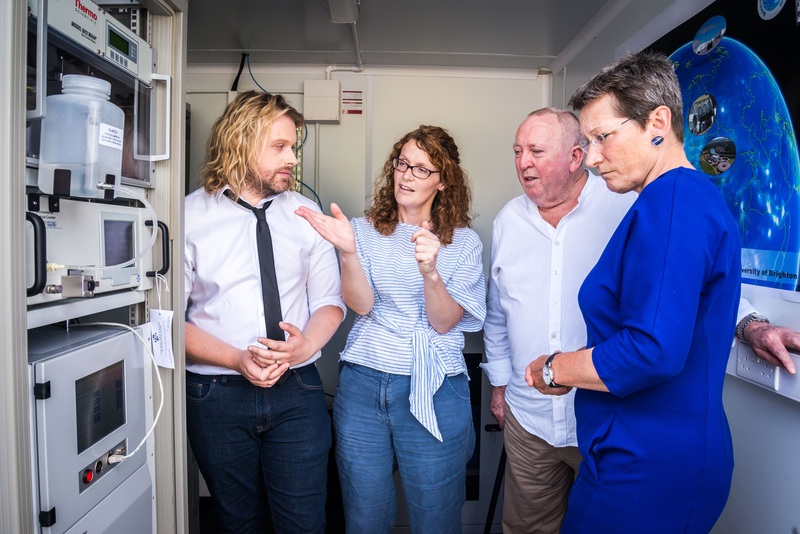 Dr Kirsty Smallbone, our Head of School, Andrea Lee, Healthy Air Campaigner at ClientEarth, and Keith Taylor, Green Party MEP for South East England, are keynote speakers at “Air Pollution – Plans to Tackle a Public Health Emergency” starting 6pm on 17 July at the Brighthelm Centre in North Road. Keith Taylor said: “As a member of both the European Parliament’s Transport and Environment committees, I am confronted on a daily basis with the discrepancy between the current approach to ensure mobility across Europe and the pressure this puts on our air and resources and the planet’s climate. Everyone is welcome to attend the free event; register via Eventbrite here. As part of International Women in Engineering Day 2017, Dr Mary Geary, research fellow in our school, shares her experience of a career in STEMM research and the support she received from the University of Brighton on returning to STEMM research after a career break.